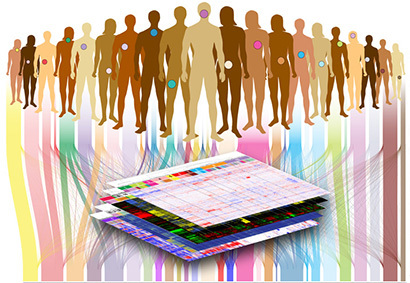 The Pan-Cancer Atlas is the most comprehensive cross-cancer analysis to date and is the final output of The Cancer Genome Atlas (TCGA) program, a joint effort of the National Cancer Institute (NCI) and the National Human Genome Research Institute (NHGRI). 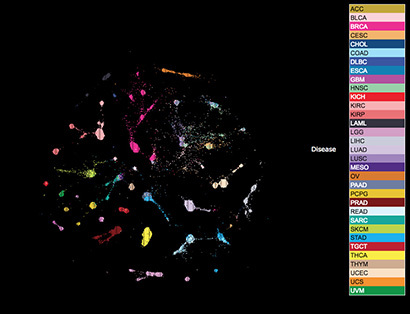 Cancer researchers analyzed and classified over 10,000 tumors representing 33 different types of cancer to trace the connections between different cancers. Typically cancers are classified by where they originate in the body—think breast cancer, stomach cancer, and so on. But a collaboration called the Pan-Cancer Initiative, launched in 2012 at a meeting in Santa Cruz, California, sought to study cancers from a new angle—a molecular one. Preliminary analyses showed cancers that start in different organs actually share commonalities at the molecular level, whereas cancers that originate from the same tissue can have very different genomic profiles. Stuart and Benz are senior authors of one of the papers, published in Cell and led by Peter Laird of Van Andel Research Institute, which provides a roadmap for other researchers seeking to delve into the findings of the various working groups. “It’s a survey of what kinds of overarching systems underlie the data. It’s less about clinical implications, and more about the patterns we’ve found,” Stuart said. The first authors of the paper include Yau and Christopher Wong, a staff scientist in Stuart's lab at the UC Santa Cruz Genomics Institute. Even though TCGA is done—the database won’t be added to or changed—this same kind of comprehensive and collaborative multi-platform genomic analysis continues nationwide under new NCI sponsorship. Stuart, Benz, and Yau continue to work together as part of their bioinformatic analysis center for the newly constituted Genomic Data Analysis Network which, among other challenges, is tasked with determining clinically measurable biomarkers that would make it easier and more cost effective to identify a priori those same tumor molecular subsets identified by the TCGA network’s multi-platform analysis.